The Subspace Army's emblem, which appears on most of their soldiers and structures. The Subspace Army (亜空軍 Subspace Army) is the antagonistic force of the Subspace Emissary mode in Super Smash Bros. Brawl. Headed by the Ancient Minister and under the guidance of Tabuu, its aim is to expand Subspace using Subspace Bombs and to pull areas of this world into it. Most of the enemies the player faces in the Subspace Emissary are members of the Subspace Army. 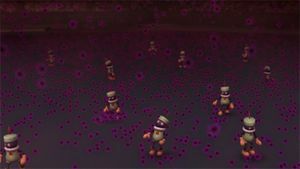 Some members of the Subspace Army, such as Poppants and Mites, appear as enemies in the Smash Run mode of Super Smash Bros. for Nintendo 3DS, with most also having corresponding trophies. However, they do not have any specific plot-related roles in the game. Tabuu controls Master Hand using the Chains of Light. Tabuu is the true leader of the Subspace Army. He uses Master Hand (bound by Chains of Light) as a puppet to give orders. Only the Ancient Minister knows about Tabuu. Ganondorf is the second-in-command of the Army, having technology to override the R.O.B.s' programming and holding dominance over a majority of the forces. He was not loyal to the Master Hand and wanted to usurp his rule over the world. Bowser is the army's third-in-command, and only takes orders from Ganondorf and Master Hand himself. In contrast to Ganondorf's more administrative role, Bowser prefers catching Smashers, as well as using his personal force of Koopa Troopas to take on large assignments, such as assaulting King Dedede's castle. He was the only Smasher to be truly loyal to Master Hand, expressing sadness to see him defeated. On the other hand, he dislikes Ganondorf-even moreso when the latter betrayed him. The Ancient Minister has a (reluctant) leadership role, commanding the R.O.B. Squad. His main task is to deploy Subspace Bombs around the world. However, he is subject to Ganondorf, Bowser, and Tabuu. After being shot many times by R.O.B.s controlled by Ganondorf, his robe was burned, showing his true identity as R.O.B. Wario is a relatively low-ranking member, and does not seem to control anyone. He only does what he does (which is capturing various Smashers) because he feels like it. He did not care about the orders he received from Ganondorf or Master Hand, preferring to go his own way. He may have also been only a bounty hunter, with no real allegiance to Master Hand. Prior to the opening, King Dedede attacked the Halberd at the same time Tabuu's forces did, preventing Meta Knight from defending the ship. While there is no evidence Dedede worked for the Subspace Army at any time, it's possible he was tricked by them into attacking the Halberd as a diversion. The Subspace Army consists of a number of enemies, the Primids chief among them. These enemies are created from Shadow Bugs, which are dropped from the Halberd. 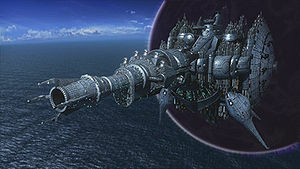 The Subspace Army also controls the floating Isle of Ancients and the Subspace Gunship. The army's weapons, equipment, and troops are almost all stolen or copied. Mr. Game & Watch was used to create Shadow Bugs, which were then used to create a massive army as well as false characters. Samus's Power Suit was apparently stolen, and Pikachu was used as a power supply. The Dark Cannon is the most powerful handheld weapon used by the Army, and these were distributed among its Smasher leaders. The following were deployed in areas where they could do maximum damage, and were used in cases where Primids would not be enough. Primids being formed from Shadow Bugs.